Gardening is good for the mind, body, and soul — there’s something about growing and caring for a plant that makes so many aspects of life feel richer. People who live in suburban or rural areas usually have lots of options when it comes to setting up a garden, but those options aren’t always available to those who have chosen to put down roots in an urban market. That’s no reason to let go of your dream of having a garden one day, though; there are plenty of opportunities for planting a seed (or seedling) and watching it grow into something that you’re proud to call yours. If you’re thinking about starting your own urban garden but aren’t sure where to begin, don’t panic! It’s probably a lot easier than you think, and you may have more gardening choices than are currently on your radar. Consider these factors and make some decisions, then start getting ready to plant the garden of your dreams. Plants need room to grow, of course, but even though you might not have an entire yard in which to establish your garden, you’ve probably still got plenty of options that might not have occurred to you. You can plant an urban garden on a small balcony or patio, a rooftop, a fire escape (just make sure you’re not blocking egress down and out of the building), a window box, and even a closet or somewhere else indoors. There might also be community garden plots available, where you can grow items of your choice collectively with other people on a designated piece of land. The amount of space available for your garden is going to determine what you can grow there and how you can grow it. If you’re lucky enough to have a yard in an urban area, then you have the luxury of building beds and grow larger items that you’ll only harvest once, such as carrots or pumpkins. But if you’ve only got a small section of balcony or a window box to work with, then you might want to opt for something that’s going to generate repeat business (so to speak), such as a tomato plant or an herb or lettuce garden. We’re sure you knew this already, but just in case: Plants need sunshine to be able to grow. Some plants require more direct sunlight than others, while others thrive with just a little light every day. So while you’re evaluating your space situation, think about how much direct sunlight that space gets — this will help you choose which plants to grow and which you might want to skip because they won’t do as well with the amount of sunlight you’re able to offer. If you’d like to grow something that requires more sunlight than you have available, think about investing in an interior gardening system. There are several smaller hydroponic gardens on the market that plug into the wall and come with everything you need, including light bulbs and seed pods, to get started with a little garden of your own. These might be a good option for you if all you really want to grow is some lettuce or a few herbs and you don’t think that the sunlight available to you is going to cut it. If you don’t have control over the landscaping around your residence, then this probably isn’t an option — but if you do, why not line the path to your door with some hardy herbs or flowers that will satisfy your need to cultivate with your green thumb? There’s a lot more you can do with landscaping than just laying down sod, and getting creative with landscaping might be all the gardening you really want (or need) to do. Maybe you’ve got space for a tree or two and can use an apple tree or find a citrus fruit that thrives in your area instead of opting for a more generic and readily available tree; it might require more care, but having something to pick when the fruit ripens is a feeling you can’t replicate with a pine tree. You also might find you enjoy spending time in your outdoor areas a little bit more if you can replace at least some of the grass with flowers or edible plants, and it also might make you feel downright agricultural when the fall rolls around and it’s time to harvest your fresh veggies or put your bulbs to bed. You’re certainly not the first person in your area to think about urban gardening, and there might be some meet-up groups or clubs hosted at the library where you can get to know other local gardeners and ask them for advice. Start poking around at your local library, the community center, and any other places that could host a gardening club, then ask if you can sit in on a meeting or two. The community garden (if one exists) is also a great place to meet fellow gardening enthusiasts. There might even be a social media group for local gardeners on Facebook or another platform that you can join — there are definitely national groups where you can find all kinds of advice. Once you’ve established a relationship with another local gardener, ask them how they got started, what they grow and harvest now (and what plants were involved in their first attempts), if they can share any success stories or failures with you — and take notes. You can learn so much from people who’ve already tried what you want to try, and if they can tell you’re really interested in what they have to say, you might be surprised by how easy it is to get details and information out of other gardeners. To trellis or not to trellis? A trellis can be an amazing space-saver; it provides a support structure for plants like beans and certain flowers to climb up. Depending on what you want to grow, a trellis might be a good addition to your garden; you can buy them ready-made or make one yourself out of scrap wood pretty easily. And if you’ve got plants climbing up the trellis, it frees up soil at the bottom of the trellis for more plants — a technique for growing more in less space that’s been utilized by gardeners for centuries. Herbs are wonderful “starter plants” for people who have never gardened before and who might not be sure where to start. They typically don’t require a lot of care, can grow well in most conditions and soils, and some herbs — like basil and mint — grow very quickly and provide a huge yield for the amount of time and effort you put in. If you’re not entirely sold on the idea of an urban garden, or you’re simply concerned that you aren’t going to have a lot of time or energy to put into the project, then creating a small herb garden with plants you know you’ll use is a great way to get your green thumb tingling. Parsley, chives, coriander, and oregano are all very easy to grow, too — lemongrass can be really fun as a starter plant; you don’t even need soil to grow it. Whether you want to plant yourself a small herb garden or you’re much more ambitious than that — good for you! — you’ll want to think hard about which plants to grow and how you’ll take care of them. Some people want to try urban gardening because they like the idea of growing their own food, and that’s definitely part of the appeal, but there’s also absolutely nothing wrong with just wanting to have more green, thriving things around you, or infusing a little bit of beauty into your life by planting flowers. Now that you’ve assessed the amount of space you have, the amount of sunlight available, and whether or not you want to start small with herbs or go all-out with more options, it’s time to make some decisions. This is where your local gardeners or nursery can become a huge resource; they can help you understand which plants tend to thrive (and which don’t) in your area before you go and spend a bunch of money on seedlings that aren’t going to make it. The garden clubs or even the botanic gardens in your area might have seed and plant swaps and sales, which are absolutely fantastic resources for even the beginning gardener. You might not have anything to swap this year, and that’s OK — just showing up and asking questions will help you learn a lot about the different plants you might want to start growing, and you can always ask the person with the seed or plant to swap where they got it and source your own based on their responses. Plus, you’ll start making some new gardening connections, and that can most definitely be helpful if and when you need to troubleshoot your garden. Depending on whether you’re building a gardening bed, planting your garden in pots, investing in a window box, or using a different way to grow your garden, you’ll want to make sure everything is prepared for the seedlings or seeds that you’re about to place in their care. Make sure that everything you’re using is at least relatively clean — if you see any signs of mold or smell anything funky, give the container a good wash before you even consider putting a plant in there; some bleach or other heavy-duty cleaner might be in order to make sure it’s really gone. And test out your containers or beds by setting them up and making sure that the amount of sunlight you estimated they’d get is more or less on target. Plants need water, but did you know that you can drown a plant? It’s absolutely possible, and it happens when there’s nowhere for the water to drain if the soil is beyond saturated — so don’t forget the drains if you’re using pots or a window box! Most pots have holes in the bottoms that will allow for drainage, and there are window boxes available that are made from more porous materials that will let the water seep out (make sure it’s not going to drip on any downstairs neighbors if that’s the case, though). If the pot you’re using doesn’t have a drain and you can’t drill one very easily, then it’s probably better for a succulent that you aren’t going to water very often (and make very sure you don’t over-water it). If the drain is too big and you’re worried you’re going to get soil all over your nice carpeting, get a floor guard for the pot to rest on top of; you can even use some rocks or pebbles to put over the drain so it’s not entirely blocked but isn’t leaking soil everywhere. The type of soil and fertilizer you need is going to depend on the type of plants that you’re growing — and if you’re going all-out with boxes and planning to grow several kinds of plants, then you’ll want to think about finding soil that works well with all of them or even choosing a couple of different kinds of soils and fertilizers and using them in different boxes. This is another question that gardening groups can help you answer, and the local nursery probably also has some resources for how to choose the right soil for your new babies. You’re probably not going to need to buy worms or other potentially strange items for your first urban garden (though that might change if you’re really digging in and putting garden boxes in your yard), but you are going to need some basic tools like a watering can, a trowel, possibly a rake, and other garden tools that will help you keep your plants healthy. Your local gardeners might be useful helping you figure out what you need immediately and what you can skip for now in terms of tools; ask them what they bought first and what they wish they’d bought sooner. If you’re using an indoor gardening set, then you might need to buy seed pods for it; and if you want to use a trellis and aren’t going to build one, you’ll need to find that, too. Of course, you don’t need to buy everything brand-new that you might need — swap meets, community sales, and Craigslist were made to help you find deals on items like these, especially if you aren’t sure that you want to be a gardener for life. Shop around, and talk to your gardening contacts about where they usually get their tools and what to look for (and avoid) when it comes to buying new and used. Pests aren’t only for gardeners who live in the suburbs — you might not have to worry about deer munching all your tomatoes in an urban garden, but there are still insects and squirrels to contend with at the very least. Think about how you’re going to keep your plants safe from potential pests. It’s probably going to be harder to keep squirrels out of your rooftop garden or a community garden than a window box, and if you’re planting exclusively indoors, there’s good news: Your plants might not get as big, but you’ll have far fewer pests to handle. 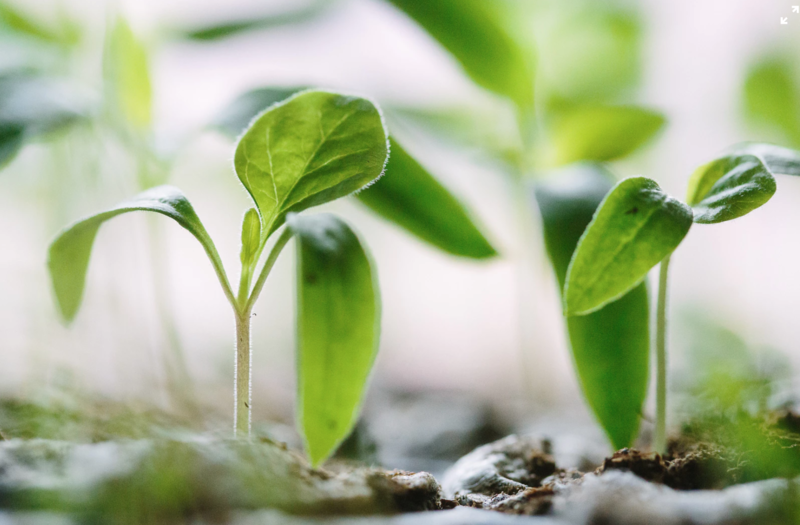 When you’re just starting out as an urban gardener, it’s probably better to buy seedlings — which have already survived growing from seeds and have at least a few leaves to help them grow — than to start your plants from seeds. Now that you’re ready to start planting, figure out where you’re going to obtain those seedlings or seeds (if you haven’t already gathered some at the seed or plant swaps we mentioned) and get moving! There’s no rule saying you can’t keep seeds from this year’s plants and try to do it all on your own next year, but you’ll probably have a better experience (and more live plants in the fall) if you go with seedlings, at least at first. You probably think you’re going to remember where everything is in your garden … but you’ll probably be surprised by how similar some plants can look and how much trouble you have differentiating them from one another. You can either use the plastic tags that likely came with your seedlings or make your own little signs to mark your plants, but do try to signify somehow which plants are where — that way you won’t have to wait for the plants to start producing little tomatoes and peppers before you can tell them apart. Water — but not too much! To maintain your garden, you’ll have to water it. Make sure you aren’t going nuts with the watering can, though; plants can definitely get overwatered, and there’s a sweet spot for most of them where the water is “just right.” Additionally, if your plants are getting any outdoor exposure, you’ll want to account for the water that falls from the sky — also known as rain — when you’re nourishing your plants to maturity so that you can calculate the right amount to give them every day. Keep an eye on your garden, not only for signs of pests but also for any weeds or potential problems that might pop up with your plants. It’s possible that at some point, some plants might need more fertilizer (or different fertilizer) than others, so you’ll want to keep tabs on what’s happening and possibly take pictures to share with your fellow urban gardening enthusiasts. In fact, taking pictures throughout the process is a lovely way to remind yourself of how far your garden has come — don’t forget to photograph any food you make using the delicacies from your very own garden! Urban gardening is a rewarding way to spend your spring, summer, and fall — and it’s not as hard as you might imagine. If you plan ahead and find resources to help answer your questions, you’ll be pleasantly surprised by the amount of fruits, vegetables, and flowers that your garden can yield for you by the time harvest season rolls around, and it gets easier every year. Maybe next year you can be a local gardening expert advisor to someone who’s just getting started!